On October 1, 1958, the world’s first civilian space agency opened for business as an emergency response to the Soviet Union’s launch of Sputnik a year earlier. Within a decade, the National Aeronautics and Space Administration, universally known as NASA, had evolved from modest research teams experimenting with small converted rockets into one of the greatest technological and managerial enterprises ever known, capable of sending people to the Moon aboard gigantic rockets and of dispatching robot explorers to Venus, Mars, and worlds far beyond. In spite of occasional, tragic setbacks in NASA’s history, the Apollo lunar landing project remains a byword for American ingenuity; the winged space shuttles spearheaded the International Space Station and a dazzling array of astronomical satellites and robotic landers, and Earth observation programs have transformed our understanding of the cosmos and our home world’s fragile place within it. Throughout NASA’s 60-year history, images have played a central role. Who today is not familiar with the Hubble Space Telescope’s mesmerizing views of the universe or the pin-sharp panoramas of Mars from NASA’s surface rovers? And who could forget the photographs of the first men walking on the Moon? 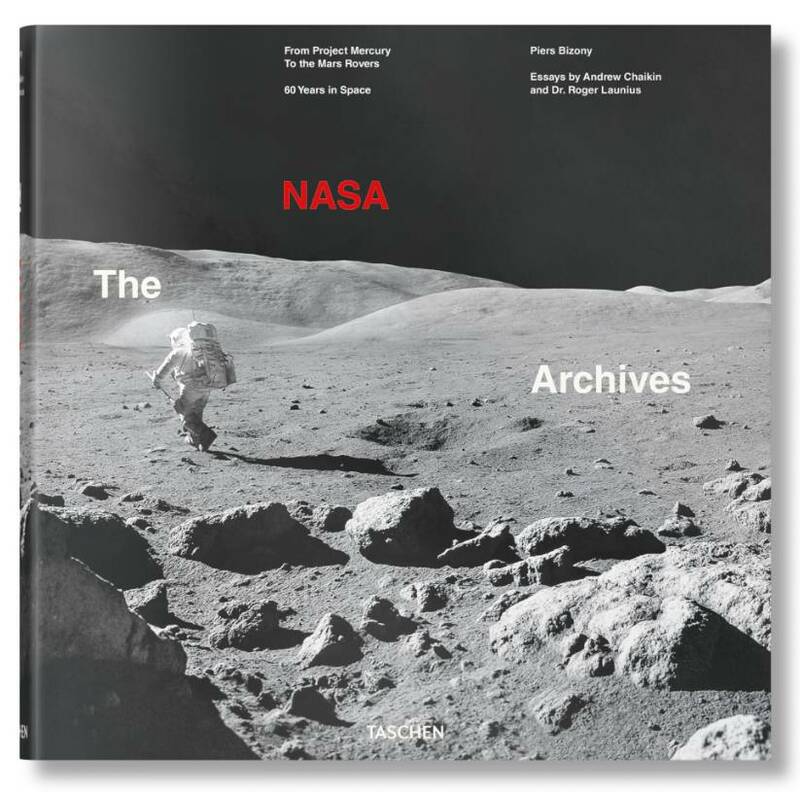 Researched with the collaboration of NASA, this collection gathers more than 400 historic photographs and rare concept renderings, scanned and remastered using the latest technology and reproduced in extra-large size. Texts by science and technology journalist Piers Bizony, former NASA chief historian Roger Launius, and best-selling Apollo historian Andrew Chaikin—and an extensive mission checklist documenting the key human and robotic missions—round out this comprehensive exploration of NASA, from its earliest days to its current development of new space systems for the future. The NASA Archives is more than just a fascinating pictorial history of the U.S. space program. It is also a profound meditation on why we choose to explore space and how we will carry on this grandest of all adventures in the years to come.